Gulfstream Park announced on Thursday morning that it has cancelled its live racing cards from Thursday, Sept. 7 through Sunday, Sept. 10 due to the unexpected path of Hurricane Irma. Gulfstream is in Hallandale Beach, Fla., and is halfway between Miami and Fort Lauderdale on Florida’s Atlantic coast. Gulfstream will be open this Thursday and Friday for simulcast wagering. Gulfstream will monitor the storm throughout the weekend. Racing is tentatively scheduled to resume Wednesday, Sept. 13, which was a scheduled makeup day. Gulfstream’s casino will be open through Friday evening. “Our first priority is the safety of our patrons and our equine athletes,” said P.J. Campo, General Manager of Gulfstream Park and Vice President of Racing for The Stronach Group which owns Gulfstream. 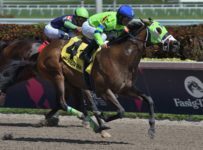 “Horsemen are being given the option to keep their horses at Gulfstream, Gulfstream Park West (Calder) or move to our training facility at Palm Meadows in Palm Beach (County),” he said.